Stitch Fix, one of last year’s high-profile IPOs, has had a bumpy ride for the past few quarters — but it blew out expectations this afternoon for its most recent quarter, and the stock went absolutely nuts. There’s also a ton of news coming out from the company today, including the hire of a new chief marketing officer as well as the launch of Stitch Fix Kids. All this is pretty good timing because the company appears to be cramming everything into one announcement that is serving as a very pleasant surprise to Wall Street, which is looking for as many signals as it can get that the subscription e-commerce company will end up as one of the more successful IPO stories. Shares of the company are up more than 14 percent after the release came out, where the company beat out expectations that Wall Street set across the board — which, while not the best barometer, serves as a somewhat public barometer as well as what helps determine whether or not it can lock up the best talent. However, following the announcement, Stitch Fix’s stock came back down to Earth and is up around 4 percent. Q3 Revenue: $316.7 million, compared to $306.4 million in estimates from Wall Street and up 29 percent year-over-year. Q3 Earnings: 9 cents per share, compared to 3 cents per share in estimates from Wall Street. Q4 Revenue Guidance: $310 million to $320 million, compared to Wall Street estimates of around $314 million. Cost of goods sold: $178.5 million, up from $139.7 million in Q3 last year. Gross Margin: 43.6 percent, up from 43 percent in Q3 last year. Advertising spend: $25.2 million, up from $21.3 million in Q3 last year. Active clients: 2.7 million, up 30 percent year-over-year (2.5 million last quarter). Q3 Net income: $9.5 million ($12.4 million in adjusted EBITDA). Stitch Fix Kids will carry sizes 2T to 14, which will be across a diverse range of aesthetics “to give kids the freedom to express themselves in clothing that they feel great wearing,” the company said. Those Fixes will include 8 to 12 items that include market and exclusive brands. Stitch Fix launched Stitch Fix Plus in February last year. 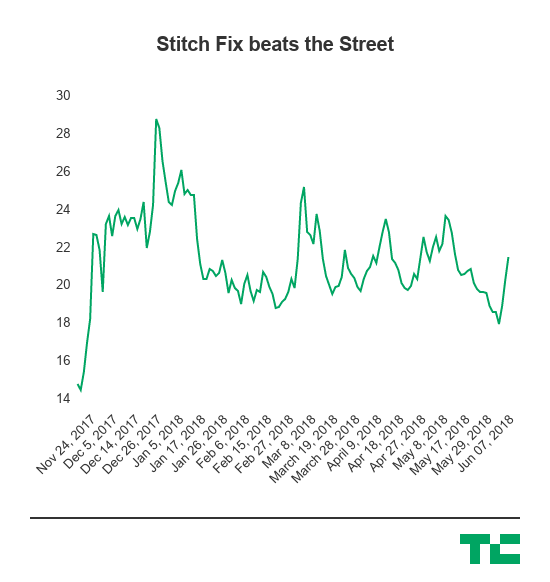 Stitch Fix was widely considered a successful IPO last year, though it faced some challenges over the course of the front of the year. But as it’s expanded into new lines of subscriptions, its customer base still clearly continues to grow, and the company is still finding newer areas to expand — including the upcoming launch of Kids that it announced today. 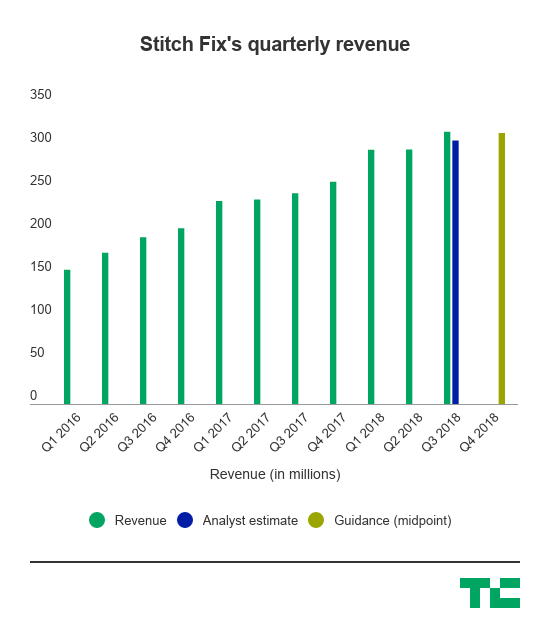 Like many recent IPOs, Wall Street is likely going to look for continued growth in terms of its core business (meaning, subscribers), but Stitch Fix is showing that it’s able to not set cash on fire as fresh IPOs sometimes do. Stitch Fix’s new CMO, Deirdre Findlay, comes to the company from Google, where she oversaw the Google Home hardware products, which included Home and Chromecast. Prior to that, Findlay has a pretty extensive history in marketing across a wide variety of verticals beyond just tech, including working with Whirlpool Brands, Allstate Insurance, MillerCoors and Kaiser Permanente, the company said. While Stitch Fix is a digitally native company, it’s not exactly an explicit tech company and requires expertise outside of the realm of just the typical tech marketing talent — so getting someone with a pretty robust background like that would be important as it continues to expand into new areas of growth.